This is very important question for interview perspective. First understand, what is deadlock and how to generate the deadlock, i.e write a code to generate deadlock. In this post we will learn these and also to learn how to solve the deadlock. The synchronized keyword is used to make the class or method safe which means only one thread can have a lock of synchronized method and use it. Other threads have to wait till the lock releases and anyone of them acquire that lock. It is important to use if our program is running in multi-threaded environment where two or more threads execute simultaneously. What is a Deadlock ? In Java multi-threading, Deadlock is a situation where minimum two threads are holding lock on different resource and both are waiting for others resource to complete it's task. And both threads can hold lock forever and none of them complete it's task. The above program will hang forever because neither of thread to proceed to execute the task and not to release the lock . In above code, just change the order of the lock and check the output. It can solve the deadlock problem. This code is simple deadlock problem and solution but in real time application it's complicated to find out deadlock and also complicated to fix the deadlock issue. Lock a specific member variables of class rather than locking a whole class. Use Thread join method, possible try to use join method. Advantage of join is it will start and end sequentially. VisualVM and jstack these are the tools to detect the deadlock in java. For more details about VisualVM and jstack refer Java thread dump. 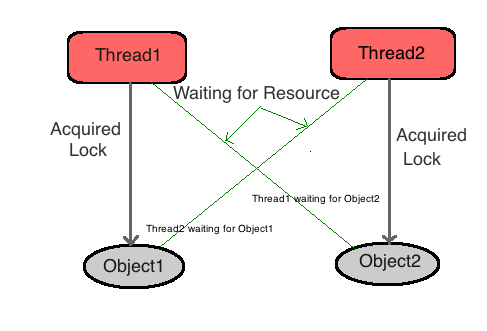 1) Explain Thread life cycle and difference between wait() and sleep() method.